Attend this special afternoon based on relationships, and learn how to ignite your heart’s lantern. Whether you are working on moving beyond past hurts, celebrating or struggling with a life change, or simply expressing your respect and love…this event will bring awareness on how to bring greater intimacy and joy into your relationships. 1) You are in a relationship and want to improve or supercharge it. 2) You continue to repeat the same types of relationships and want to change the pattern. 3) You aren’t in a relationship but are ready for one. Intimate relationships are often the most challenging connections in life. They are laden with promise for safety, pleasure, and fulfillment, but frequently become battlegrounds where insecurities and personal demons come out to play—robbing the joy from what you hoped would be paradise. 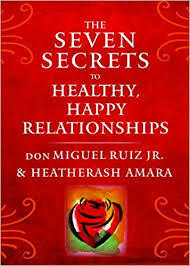 Don Miguel Ruiz Jr. has spent decades learning how to heal the wounds that conditional love left in his life, which left him free to love unconditionally. This means greater liberation, deeper intimacy, and tremendous honesty—the ingredients for real happiness in loving partnerships. Make new Agreements that are more in line with your true Authentic Self. To bring harmony into your life as a Master of Self. Don Miguel Ruiz Jr. will share lessons, based on the Toltec Tradition, that are designed to help you enter a new space in your own being—one that allows you to love without fear. The way you see yourself and your beloved will never be the same!